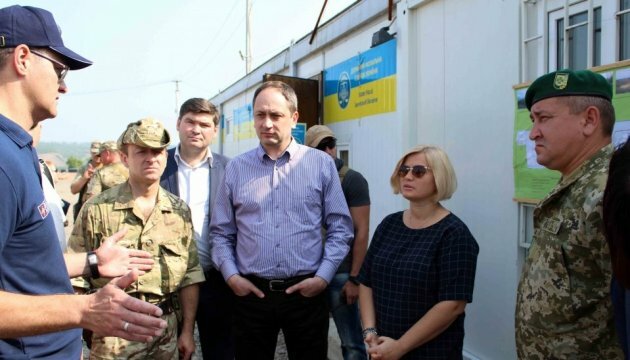 Vadym Chernych, the Minister of Ukraine for the Temporarily Occupied Territories, and Ukrainian MP Iryna Gerashchenko inspected readiness of “Zolote” entry-exit checkpoint in Luhansk region for the opening. This is reported by the press service of the Luhansk region department of the State Emergency Service of Ukraine. "Today, 29 July, Vadym Chernych, the Minister of Ukraine for the Temporarily Occupied Territories, and Ukrainian MP Iryna Gerashchenko have visited “Zolote” entry-exit checkpoint. The purpose of the visit was to inspect the readiness of the checkpoint for the opening and ensuring the safety of citizens," the statement says.